It’s no secret that the internet has made it much easier for students to plagiarize. As a result, educators from across the spectrum are facing the similar obstacles in their attempt to combat or curtail this phenomena. While much of the blame is put on the students themselves, the growth of this problem can also be attributed to bad media literacy training. Students are constantly faced with information overload in a media ecology where information wants to be free, and at times cultural principles are in direct opposition to those found in institutions of learning. This confuses students, and blurs the lines of what is considered ethical and/or what is expected from them as students. The following techniques will help educators better understand how to combat online plagiarism and strengthen critical thinking skills. 1. At the beginning of each schools year, check your school’s plagiarism policy. If there isn’t one, encourage administrators to create one. If one exist, make sure it is up-to-date. Remember, in the digital era, changes to the media ecology happen quickly and often. 2. Gather a group of colleagues from both your school and surrounding schools for semester meetups. The educational landscape has changed dramatically in the past five years and will continue changing at a fast pace thanks to technology. Having a space where you can receive support and gain wisdom from educators is both essential and powerful. 3. Make your expectations regarding their conduct crystal clear at the beginning of each semester. Review in detail what plagiarism is and the various forms that exist. Assuming that students know what is ethical or common sense is the worst thing you can do as an educator. 4. Make the consequences of bad actions clear. Instead of just instilling fear, explain that penalties are there to ensure that honest, hard working students are protected. Doing this also prevents future plagiarist from claiming ignorance as a defense. More importantly, it shows that you are serious about creating a safe learning environment. 5. Investigate meaningful conversations regarding what it means to do good research, be a critical thinker, and have strong writing skills in the digital era. Most importantly, ensure that your students understand what is considered a trusted authority. Remember, never in the history of man have individuals had so much information at their fingertips, and navigating through this plethora of information can be challenging. 6. Don’t just disregard Wikipedia and similar sites. Instead, show them the value of these types of sources and how to properly use them. Wikipedia, for example, should never be cited or copied, but it may be a good starting point to get a general idea of a topic, and get links to trusted sources. 7. Explain why citing sources is important and why using them will actually improve their research skills and overall paper. Take time to also review how to cite sources. Remember, some students may never have been taught how to do so. Many individuals cheat because they never received proper training and find projects such as term papers overwhelming. 8. Direct students to resources that will help them develop their writing and research skills. Many individuals cheat because they never received proper training and find projects such as term papers overwhelming. Students in any class come from diverse educational backgrounds that are marked by the institutions they attended as well as the individual educators they have had. 9. Use discussion boards to gauge students writing skills and style. While the language they use may be more informal, it will definitely provide you with a baseline for each student. 10. Focus on the process. Ask students to submit outlines and drafts instead of just finished products. It will take the edge off, allowing them to focus more on the task at hand (i.e. learning) than their anxiety of getting a good grade. Additionally, knowing that they will receive feedback during the creation phase may motivate them to be more invested in their project. 11. Try to provide students with tips and techniques on how to best manage their time, and prepare for larger writing assignments. Many times students copy work because they leave things to the last minute and are afraid that they won’t meet deadlines. 12. Avoid assigning topics that are too general. While a student can easily find/buy a paper on a topic like the Gulf War, it would be more difficult to find one on the NYPD’s Involvement with the Gulf War. Additionally, make sure to change topics every semester. 13. Specify the sources students should use. Doing so will make it extremely difficult to find writing pieces that are specifically using the sources you specify. In many cases, doing the research may be more time intensive than actually doing the task you assigned. 14. Ask that students submit an annotated bibliography. This includes their evaluation about how useful a source was, where they located it, and their thoughts on how credible it is. Besides helping deter plagiarism, this simple exercise will also help students develop their media literacy skills by comparing and contrasting sources. 15. Assign each student an oral presentation of their paper which they must present to the class via video chat. 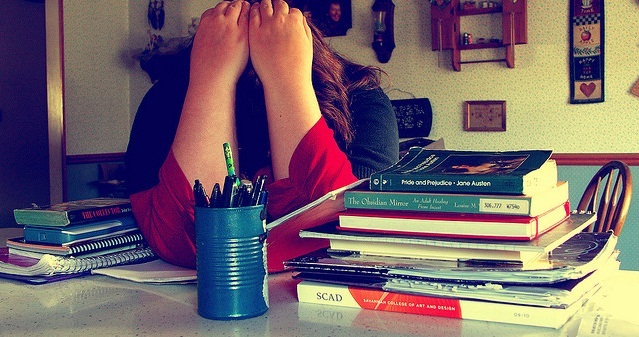 The fear of being publicly embarrassed is usually a good plagiarism dissuasion, and will push students to work harder at understanding the material. 16. Require students to write a blog post or essay about their experience researching and writing their project. Ask detailed question they must answer in the post such as: What type of research strategy did they use? What obstacles did they face? How did they find and identify the best sources to use. 17. Request that students submit their assignments through one of the various anti-plagiarism software. Besides saving you time, this simple process may deter a large percentage of would be plagiarist. 18. When in doubt, a web search is more powerful than it seems. Search engines like Google and Bing have exact word search option, and the percentage of the web it scans is quite remarkable. Additionally, you can use one of the many plagiarism software detectors available online. 19. In an online class environment, time restriction is the biggest deterrence for cheating. Give multiple-choice quizzes, and ask question on discussion boards providing them with a time limit. 20. Trust your instincts. At the end of the day, years of training and experience cannot be ignored. While formats and options are changing, education is still about people and having a deep understanding of the educational process. Your skill and knowledge as an educator is irreplaceable.